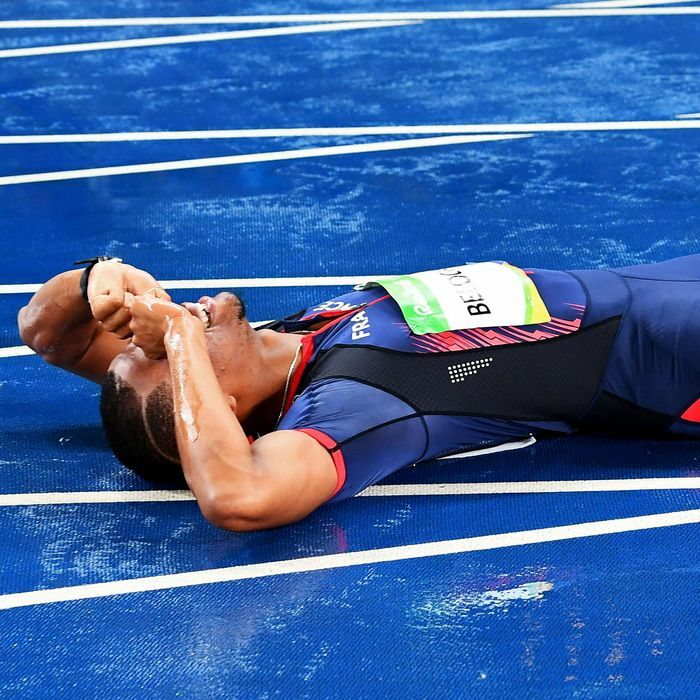 French sprinter Wilhem Belocian went all the way to Rio to participate in just one event — the 110-meter hurdles. He’ll go home without taking a single stride thanks to a devastating track-and-field rule that disqualifies an athlete for a single false start. Belocian’s early movement in Monday’s preliminary heat wasn’t even obvious to the naked eye. But he knew it the instant he did it, and the slow-motion reply made it clear. The 21-year-old jumped a fraction of a second too early — a mistake that will force him to wait another four years for a shot at Olympic glory. Before clearing the track so the race could continue, Belocian fell to his knees and pounded the ground. He was crushed. Heartbreaking. Wilhelm Belocian of France false starts in his first Olympics. Belocian is the latest victim of the zero-tolerance false-start rule that the International Association of Athletics Federations instituted in 2010. The previous rule allowed for one false start among all athletes in each race. The second would be met with a disqualification, no matter who jumped. That rule was put in place in 2003, replacing a much more forgiving policy that allowed every athlete one false start before getting disqualified for the next one. The new rule in 2010 came at a time when slow runners were deliberately jumping to put pressure on the rest of the field. Those who were typically quick off the blocks were forced to be extra careful and would react just a little slower. At least that was the idea. Eliminating that bit of gamesmanship was part of the reason for instituting the one-and-done false-start rule. The other part was TV. Intentional false starts across races would drag out a meet, causing broadcasts to run long and annoying TV executives. Over the years, some of the sport’s highest-profile athletes have fallen victim to this severe rule, including Usain Bolt. In 2011 he was DQ’d from the 100 meters at the world championships in Daegu, which started an outcry to change the rule. Complaints centered less on its unforgiving nature and more on its potential to eliminate superstars from the sport’s most important races. Could the 100-meter dash truly determine the world’s fastest man if Bolt was disqualified after a false start? At the time, much of the grousing was about the potential for the rule to negatively affect the 2012 Olympics, which didn’t happen. It hasn’t had much of an impact in Rio either. Elite sprinters have altered their approach and become slightly more cautions on the starting block. And the IAAF threw them a bone by changing the definition of a false start prior to the London Games. The changes made it so that an athlete had to remove his feet from the blocks or his hands from the track in order to commit a false start. The twitches and flinches that would doom a sprinter in the past no longer presented a problem. So far, major false-start catastrophes have been avoided. At least as far as fans are concerned. But for Belocian, what happened in Rio was a tragedy, and he’s not the only one who’s been snakebitten by the rule. The same fate befell Andrew Fisher, a Jamaican-born sprinter who was competing for Bahrain in Rio. After running the seventh-fastest time in the prelims of the 100 meters, Fisher jumped a moment too soon in the semifinals. His Olympics were immediately over.